Anyone who has been to Japan and had the opportunity to immerse him/herself in Japanese culture , will have experienced a Japanese cultural icon known as an izakaya. An izakaya is a casual Japanese pub or drinking place where food is served. Emphasis is on it being a casual experience. Inakaya, located at the Venetian Village at The Ritz Carlton in Abu Dhabi, has taken that concept, but tweaked it to reflect its own brand which has three other Inakaya restaurants around the world: Tokyo, New York and Hong Kong. 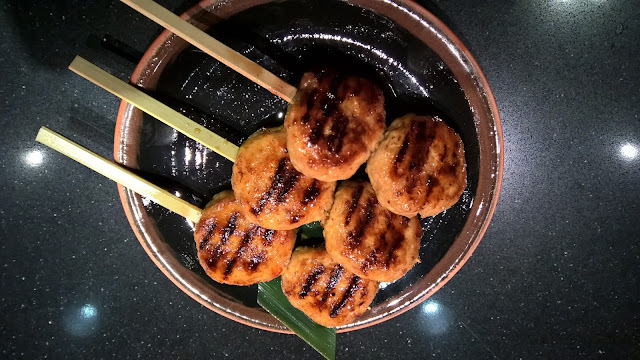 The twist at Inakaya is the robata grill concept in which fresh ingredients are theatrically prepared and served on large wooden paddles - high on theatre, but no where near as unJapanese and dare I say corny as Americanised teppanyaki performances. It offers more authenticity. Inakaya is, therefore, unlike any other Japanese experience in the city, and its one of a kind style makes it a very desirable venue. As we arrive, we walk under a large banner hanging outside announcing the name of the restaurant. A hostess in kimono greets us and we are seated bar style, seating that is part of the robata grill experience. Despite decor having been chosen with a foreign market in mind, it still feels very Japanese - I have had the pleasure of visiting a few izakayas in Nagoya and Tokyo. It is quintessentially Japanese with emphasis on minimalism. 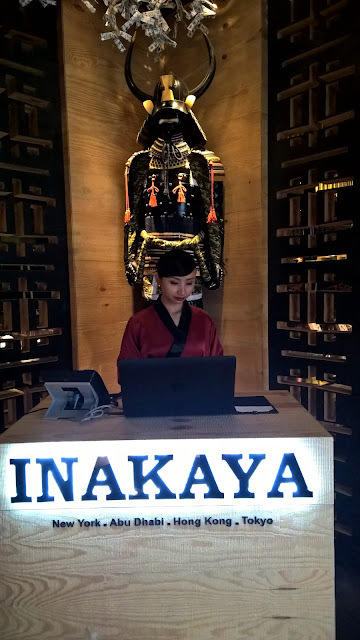 I like that it is not kitschy at all, and it is clear that Rika Yusmita, General manager of Inakaya, has her finger on the pulse of Japanese culture because she has done a fabulous job with the decor. 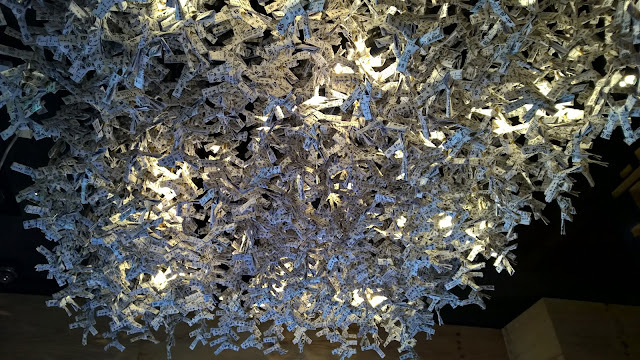 Paper ribbons hang from the ceiling. In terms of decor, three special touches for me are the sake bottles suspended from the ceiling in one dining area, Japanese paper ribbons recalling shrine visits hanging from the ceiling at the entrance, and the almost zen like glass dining area which is so unbelievably tranquil. The evening kicks off with a sake mojito. Refreshing and appropriate! Soon after Shimeiji mushrooms followed by Yellow Tail carpaccio are served. The carpaccio is a seemingly simple dish, but with thinly cut fried garlic pieces and soy yuzu sauce, it packs a lot of flavour. Soon after, Tsukune, grain fed chicken skewers, is served on a big wooden paddle as mentioned earlier. It is fun and engaging, as the process starts when the order is taken. 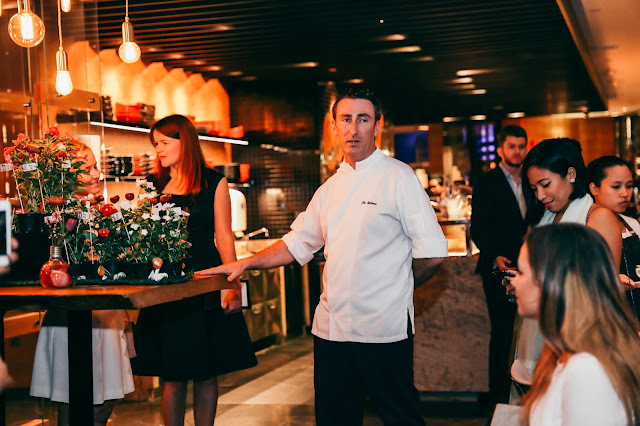 It is then shouted to a chef at the back who shouts it in return. As it is served, the name of the dish is called out again. I can imagine what an atmosphere it must be on a Thursday night when the restaurant is full. 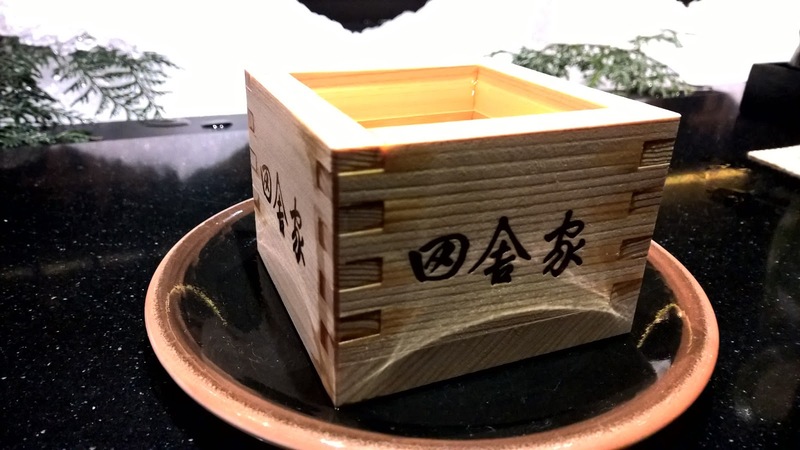 For my next drink I have the house sake, known as Masu sake, so called because it is served in square box. Recommended for that other world experience, crossing a cultural divide. 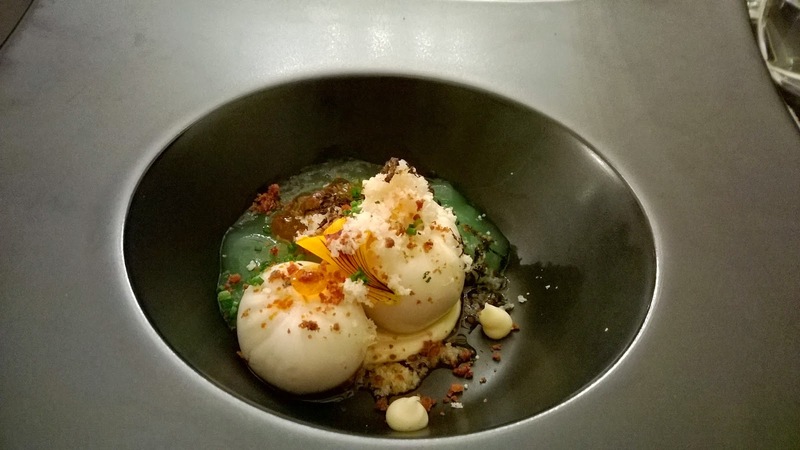 One of the dishes served using a wooden paddle. The main event, Kinme-dai or Golden eye snapper, is something I am excited about. 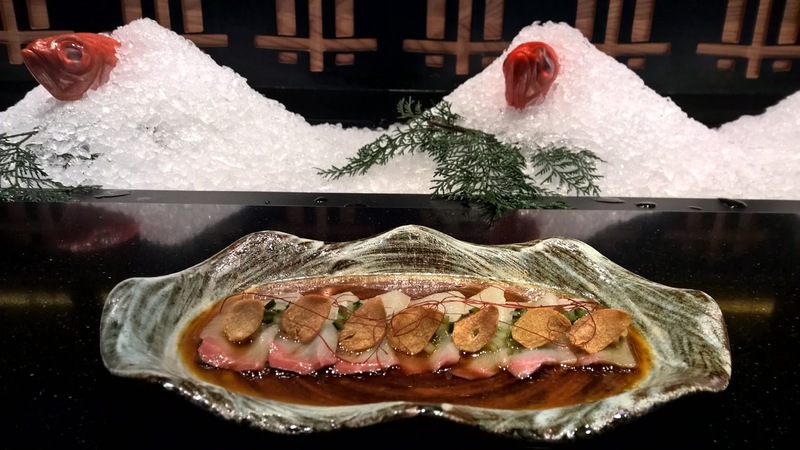 The fish, which has been perched in front of me, enveloped in ice, will be served as a whole fish. 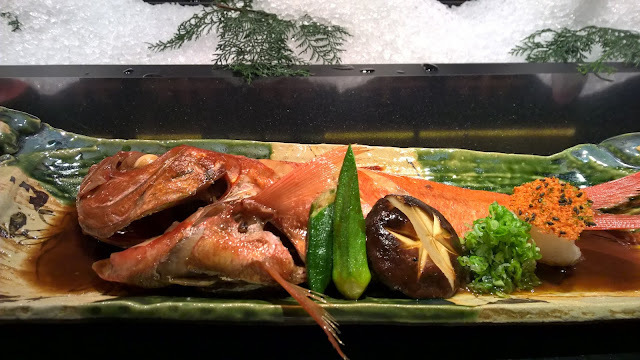 The very idea is captivating, as this fish is line caught in Japan, and tonight is served Nitsuke style, in which the fish is simmered. It is a style of preparation common in Japanese homes. The result - a typical Japanese dish where none of the flavours dominate. Balanced and natural. Okra and mushrooms on the dish add a bit more diversity, but this is about that beautifully cooked fish. 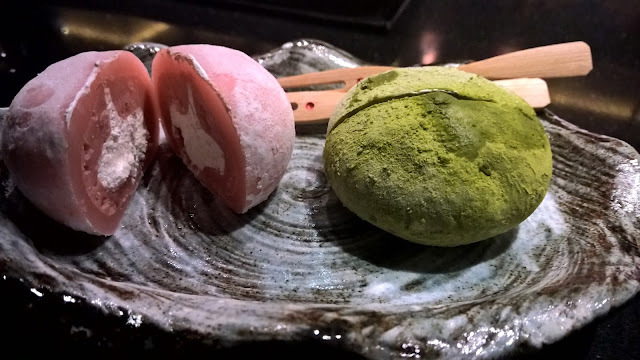 Dessert, well Mochi ice cream of course, with a centre that is more creamy than ice cream. Sheer indulgence. A standout feature for me is the manner of service. 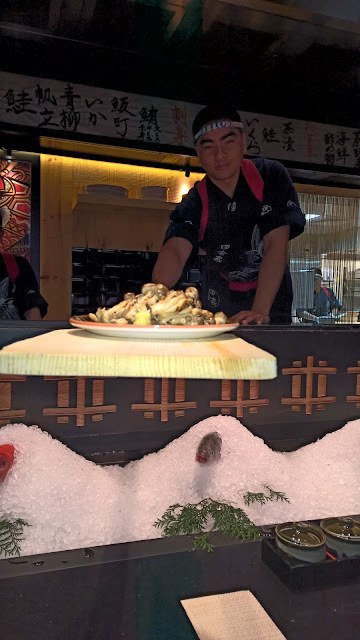 Staff understand all the Japanese names for the dishes and are able to call back the orders in Japanese. It makes for staff that are knowledgable and engaging. Also, with a very hands-on manager in Kenneth Kim, I find this to be a strong point of the evening. Service. 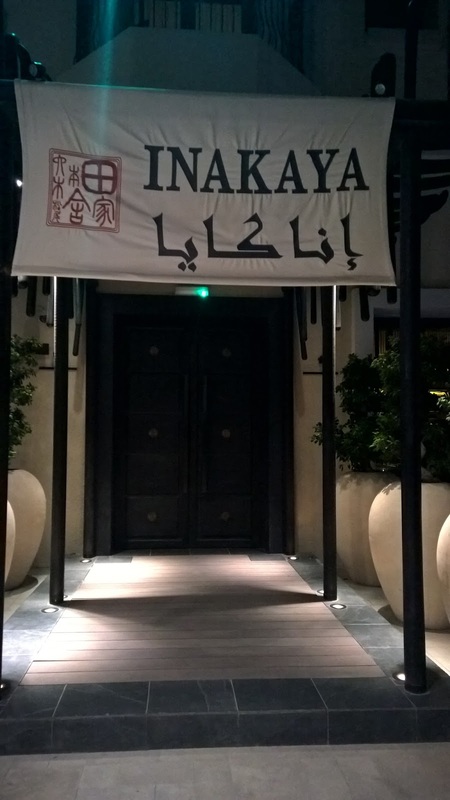 With a number of Japanese restaurants already in the city, Inakaya brings something very distinctive to Abu Dhabi. Its casual nature should not be misinterpreted as a watered down venue. On the contrary, it is a classy establishment that has an edge on its competitors because of its concept. Did I add that it offers the best value for money of all the high end Japanese outlets in the city? Furthermore, with a setting on the Al Maqta canal, it is quite an exquisite experience all round. The location allows you to arrive by car or by abra from the other side of the canal, and the latter in particular making for an all-round unique evening in Abu Dhabi. Disclaimer: I consult at restaurants and hotels in an attempt to look at the entire product to take service levels to where they should be. 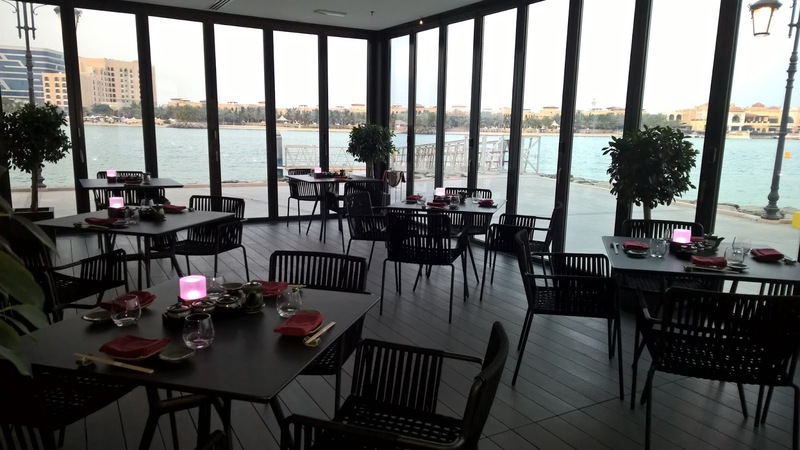 I visited Inkaya courtesy of the the restaurant.